Electronic health records can help doctors give their patients the best care, at least when it comes to diabetes, U.S. researchers reported on Wednesday. The findings are a boost to the Obama administration’s electronic health-records program, which offers doctors and hospitals financial incentives if they set up electronic health records. 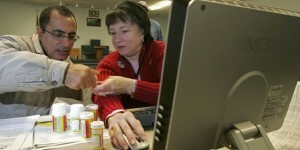 The program will start penalizing providers in 2015 by cutting Medicare reimbursement by 1 percent if they don’t use an electronic medical record. Randall Cebul, a professor of medicine at Case Western Reserve University, and colleagues found that more than half of diabetes patients got the best care as measured by four standards if their providers used electronic health records. This compares to just 7 percent of patients whose providers used old-fashioned paper, they reported in this week’s New England Journal of Medicine. The Cleveland-based study examined more than 27,000 adults with diabetes treated at 46 different practices from July 2009 through June 2010. Cebul and colleagues found 51 percent of patients treated at practices with electronic health records had received all four standards of good care for treating diabetes, like getting an eye examination to screen for diabetes-related conditions. Practices with electronic health records ultimately had healthier patients than those at paper-based clinics, with 44 percent of patients meeting four of five health goals, like keeping a patient’s weight at desired levels. Just under 16 percent of paper-based clinics achieved the same results. All of the doctors in the study are part of a regional collaboration known as Better Health Great Cleveland, which runs the gamut of treating Cleveland’s poorest and wealthiest patients. The group selected quality standards together. Members also share best practices, and publicly report outcomes. Cebul said the group was key to the success of adhering to quality standards. Cebul said improved adherence to quality standards regardless of what type of insurance patients had was a surprise to him. “I’m most pleased with the fact that the improvements were seen across insurers, so there were similar improvements and similar benefits received by patients cared for by Medicare, Medicaid, and employer-based coverage and the uninsured. Everyone seemed to benefit regardless of the coverage,” Cebul said in an interview. The study could also help illuminate how electronic health records benefit chronic conditions, Cebul said. That should catch the eye of federal policymakers, as chronic conditions are among the biggest cost-drivers in the American health system. “We’ve barely scratched the surface of what the possibilities are,” Cebul said.